In 1827, burial within the built environment was declared illegal. 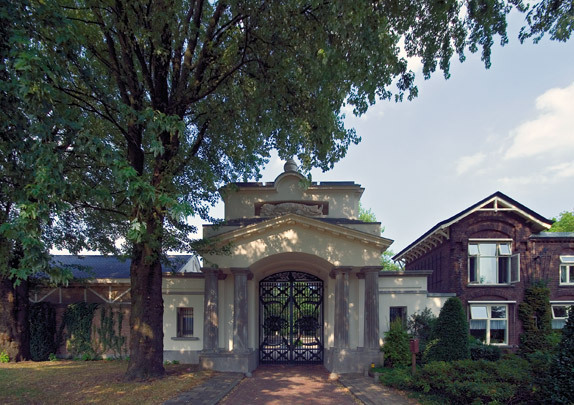 The resulting new cemetery was designed in the grounds of the former country seat 'het huis te Krooswijk' by the then town architect Pieter Adams. The entrance, its monumental neoclassicist gateway rife with symbolic sculpture, stood along the river Rotte so that the dead could be carried there by barge. Symbols of death including scythes, bats and upturned torches decorate the gate. The population explosion in the 19th century stretched the cemetery's capacity to the limit. In 1915 a new part designed by the noted landscape architect L.A. Springer was added and the main entrance moved to its present position. The new entrance and the chapel in the shape of a Greek cross were designed by the council architect D.B. Logemann. A further extension followed in the 1930s. Among the famous Rotterdammers who lie buried here are four mayors (Van Vollenhoven, 's Jacob, Wytema and Zimmerman), the socialist Hendrik Spiekman, the singer Koos Speenhoff, the painter Charles Rochussen, the city planner Van Traa and the famous German spy King Kong.